One of the simpler and under-rated joys in life is playing with kids. As it pertains to our hobby, of course, that means enjoying time spent on board games with our children, grandkids, nieces and nephews, as well as in other, family-oriented, social circles. Not only are these occasions just flat out fun, but it is important in teaching kids critical thinking skills, family bonding, and developing strong and healthy child-adult relationships. Most kids’ introduction to games will understandably include very basic titles, beginning with something like Go Fish (matching) or Memory (cognizance). From those, they will probably graduate – at least in the United States – to standard children’s titles such as Candyland, Chutes and Ladders, and Sorry. These are important in teaching young ones colors, numbers, reading, and even foundational concepts like taking turns and being good sports. A myriad number of other offerings throw in fun and dexterity elements appropriate to the age. To name only a few, you may recognize Don’t Break the Ice, Hungry Hungry Hippos, Operation, and Mouse Trap. But as they outgrow those limited games, they’ll soon reach that fork in the hobby’s road. One path is paved with the mainstream commercial staples such as Battleship, Monopoly, Clue, Life, and an unending litany of trivia games. The other trail is blazed by the lesser-known, designer titles that are harder to find outside of the internet or specialty stores. Now I don’t mean to exclusively over-simplify the categories. There is nothing wrong or right, good or bad, about either path. Different strokes for different folks. Plus there are always examples that create shortcuts and detours between the two. However, typical designer games are more sophisticated, thematically grander, and/or offer greater choices than their conventional cousins. You feel like you’re playing the game, instead of vice-versa. If you are passionate about this niche hobby, you will recognize the experiential opportunities those qualities offer in family bonding, social development, and analytical thinking. To take advantage of these benefits, I offer these tips to guide your kids into hobby gaming, which I’ve learned from playing with my own kids. Obviously, these will not apply to all kids and every family. Your own situations, styles, and personality blends will vary, and there is nothing wrong with going a different route. But these are an average measure with which to begin. 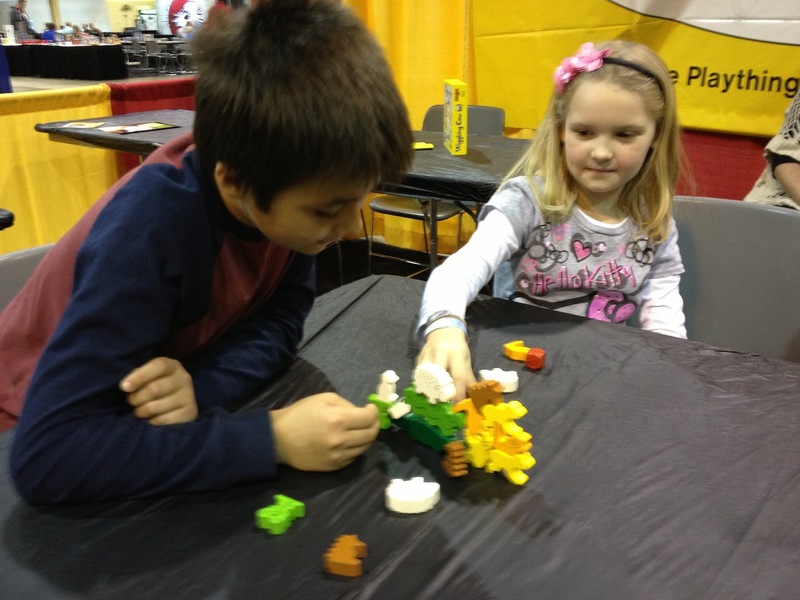 At what age is it best to introduce kids to hobby games? My opinion: 8 years old, or the typical second grader. At this age, most kids’ reading level is developed enough to independently understand the rules and text they will encounter on cards or other components. Now, many hobby games utilize iconography, and so do not require literacy. However, even those, no matter how simple, still necessitate certain comprehension and analytical skills which an extra year in school really seems to develop. Anecdotal, I know, but nonetheless. Some parents will play games with very young kids and just change the rules to make it accessible – in a sense playing a different game. But I’ve found that kids are creatures of habit. If you try this approach, be prepared that they may resist playing the correct way or be confused with changing. Plus, “bringing it down to their level” usually erases much of the flavor of strategy gaming, anyway. You might as well stick with those titles specifically geared toward kids, until they’re ready for something more complex. What mechanics work best for children? What mechanics do not work for children? Auction/Bidding: Just as in real-life, the value of a thing is whatever someone is willing to pay for it. That is rarely easily discernable. Kids often find it difficult to assign an appropriate cost to an object they desire. Many times, they pay too much for something, thus crippling them in another area. Plus, there is a psychological meta-gaming to bidding. It can be a good strategy to artificially drive up the price of something you know another player wants, while at the same time not tipping your own hand so that an opponent can do the same to you. This can really trip up and discourage kids. Negotiation: Another frustrating element because it is built on shifting sand. Games with this aspect introduce more non-quantifiable and non-tangible parameters that are difficult for children to fully analyze. It can even introduce more meta-gaming with lying, bluffing, and back-stabbing. Fun for many adults. But few things upsets kids more in gaming than a feeling of being ganged up on or betrayed. Tableau-Building: Kids generally do well in managing cards and/or resources in order to handle basic building and development mechanics. They understand how to collect A and B in order to build C, and why that’s beneficial. Tableau-building and other engine-building elements ratchet that up by not only introducing, but requiring you to create intricate relationships between cards and/or buildings: a.k.a, the “Killer Combo.” Learning the best combinations in a game of this genre can already be an ongoing process for adults, and can be downright disheartening to children. You’ll prevent much angst by waiting to unleash this style until your kids are more accustomed to the hobby. Yes. Abstract titles have less pull for children. More than that, certain themes will prove more popular than others. Sure, there are always exceptions (as with all of the points in this guide). But by and large, children are more apt to play, more comfortable with, and more attuned to games with exciting narrative. Something to connect them to the base mechanics. I realize that can be hard to define. We have a few easy titles that one of my sons refuses to play simply because the subject matter is boring. Broadly speaking, adventurous themes such as pirates, space, conquest, building, and slaying dragons are more alluring than farming, economics, and building train routes. Even superficially tacked on themes can make a surprising difference, as long as it hints at a bit of drama. Are cooperative games the best ones to start kids on? Two of the more recurring problems in gaming with children are hurt feelings and sore losing. Cooperative games would seem to address these issues by eliminating antagonism and player interaction. And that they can. However, I would actually recommend steering away from these as introductions. Competition is a central staple of gaming and sports. Might as well confront it head-on, and early. Considering again that kids are creatures of habit, if co-op titles are all they’re familiar with, they may grow too comfortable with such passive playing and so prove resistant to learning other competitive titles. Where co-ops do prove particularly handy is as an option for those kids that just really struggle with interactive games and seem to require the peaceful alternative. So what are some popular elements that can ease kids into conflict in healthy ways that develop good sportsmanship? Your Attitude: Probably most important – speak by your own actions. Get into the thematic narrative, if possible. Ham things up with a bit of drama or flare to get them into the game. Make sure you’re teaching and not criticizing. And watch your temper. I may not get mad just because my kids beat me, but I do often want to throw dice across the room after bad rolls or crumple horrible card hands in my fists! Just like birds learn to fly from watching momma, your kids will develop their gaming habits from you. Now, I’ve admittedly painted in some pretty broad strokes. There are certainly ways to counter balance any one of these points, especially since the vast majority of games are comprised of several mechanics. Have a boring or abstracted theme? Well, it may fly just fine if the game is quick, with little downtime, and tosses in a dose of luck. Have a longer game? Well, if it’s humorous or builds a fun narrative, just break it up, if needed. The variety and versatility in designer games are two of the things that make this hobby great. Finally, perhaps you’ve all been wondering if I would recommend a “Holy Grail” for introducing hobby gaming to kids. A title with so many of the above elements, I would suggest it in a heartbeat as a perfect gateway. In the spirit of this gaming guide, indeed I shall! Small World! This light, strategy game is aesthetically alluring with a humorous fantasy theme, fun art, and solid components. It is simple to understand and folds in a good variety of rule-breaking powers without being cumbersome. Turns are quick, with the overall game length lasting for a predetermined number of rounds, which keeps the affair at a reasonable, yet satisfying, time. It teaches kids the fundamentals of strategy. And conquest is focused on your active race’s goals and characteristics, which allays the personal taint and hurt feelings associated with a lot of spite. Simply put, Small World is a great title to acclimate your children to conflict and strife, which are concepts common to most hobby games in one form or another. I highly recommend it. As a board game designer, I want to make sure most (but not necessarily all) of the games I design are family friendly, including bringing in kids to play. This article is really well written, and definitely something I will refer to, while determining if one of my games fits in this category. Thank you so much!